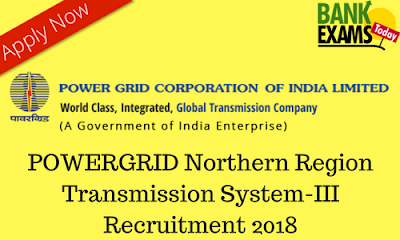 POWERGRID, Northern Region Transmission System-III, having transmission system in the part of Uttar Pradesh, Madhya Pradesh and Uttarakhand has recently released the notification for the Post of Diploma Trainee(Electrical) & Jr Officer(HR) Trainee. Jr Officer(HR) Trainee:- 4 posts. Diploma in Electrical Engineering from recognized Technical Board/Institute with not less than 70% marks for General/OBC (NCL) category and Pass marks for SC, ST & PwD Category. Note:- Candidates having Higher qualification of BE/B.Tech in the relevant discipline in Engineering from recognized University / Institute with 65% or more shall not be a bar for the respective post. Two years (Full time course) PG Diploma in Personnel Management/MSW(with Personnel Management as main subject) or equivalent from recognized Institute with minimum 55% marks for General/OBC(NCL)/SC candidates and pass marks for ST/PwD. Candidates selected shall undergo training for a period of one year. They will be required to execute a service Agreement Bond as per the following details to successfully complete the training period and thereafter serve the organisation for at least three years.